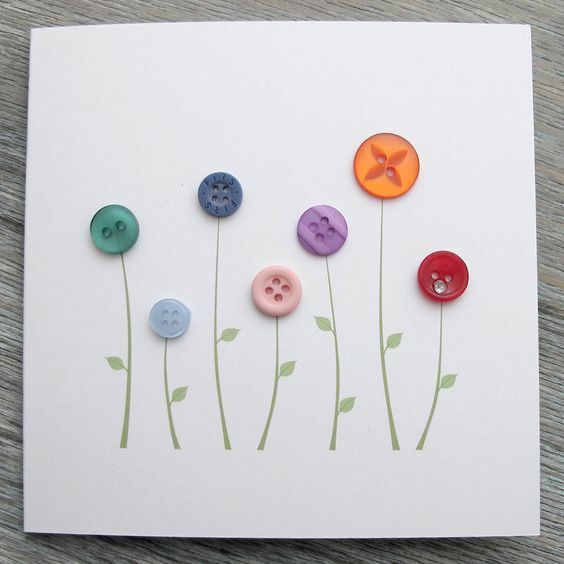 One easy way of adding texture, colour and a non paper element to your card making is to use buttons in your design. These have the advantage of requiring no additional work or steps before use – just choose the button or buttons most appropriate for your design and simply stick them on! 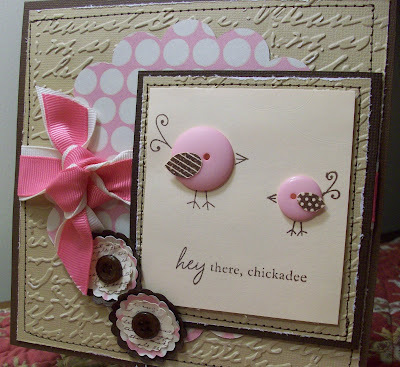 The card on the left can be found on Pinterest (posted by Joe de Bruyne) and my eye was drawn to it as a simple but efffective method of using buttons to create the design. For a basic overview of how to use buttons in card design, take a look at this “how to” guide. To create a shaped flower head, you could use flower shaped buttons such as these Dill flower shaped buttons. I love this plum colour and can see these as some gorgeous pansies. Perhaps with a nice yellow thread through the button holes? Many other colours are available so you could really go to town! Here’s another example of how to use buttons to create flower heads. This card is more intricate in design than the previous example and you’ll note that the “flower” colours have been chosen to work with the background colour of the card. If you design something like this, then a good approach would be to choose your button “flowers” first in toning shades and then match the background elements to them. Leaves of two different designs have been added to the flower stalks and give a further element of texture – albeit 2D rather than 3D – to the overall design. I’ve included this image on the left because I love the innovative way in which the buttons have been used in this design.I think that using one of the button holes as the eye for the chicks is just brilliant and I’m not sure I would have thought of this myself. That’s why the internet is such a great tool to allow ideas to be shared. You could use buttons in a similar manner to this to create all sorts of other creatures. The pink on this card makes me think of a piggie nose or two for example. You can view the image source and make details by clicking here. If you follow through and take a look at the details, you’ll see that Deanne lives in the USA and used a USA based company for her supplies. For UK residents, we recommend CraftStash for your cardstock, embossing and die cutting essentials. Now here’s another way of using buttons in your card design that doesn’t have them portraying flowers.I like the design of this ice cream cone card. It’s clean and the use of a monochrome palate works really well. The use of the multi layers and mixed sizes of the buttons creates the illusion of the ice cream spilling over the edge of the cone. You could take this idea and make it your own by turning it into strawberry ice cream for example. And perhaps add in a flake! Another easy way to use buttons on your greetings card is to turn them into balloons. This gives you a free range over colour to make it as bright and colourful as you like. Or, of course, you can keep to just a couple of colours to complement your choice of card background .In the card shown on the left, the designer has cleverly reduced the size of the buttons used towards the top of the card. This introduces perspective to the design and really creates the impression of the balloons floating away into the distance. The daisies in the foreground add a bright, springlike feel to the overall design, aided by the fluffy clouds which are not completely dissimilar to sheep! 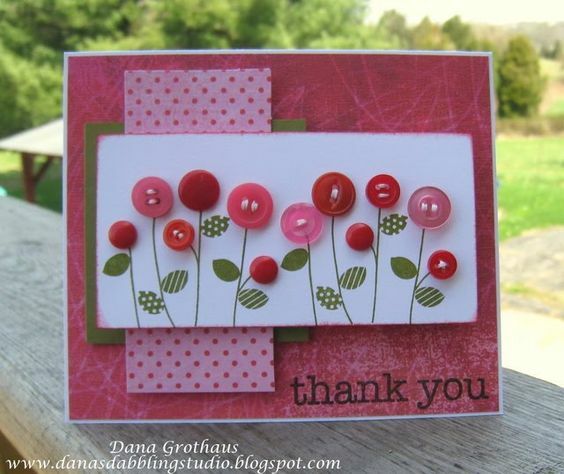 I hope this has helped provide some inspiration and show how you can use a textural element such as buttons in your card designs. After all, who doesn’t have a button tin?